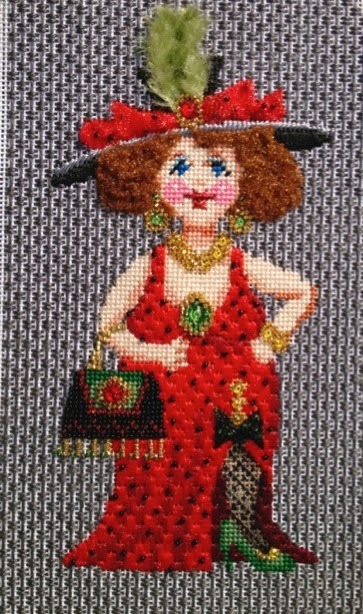 This design was such a delight to stitch and work with. I had so much fun! Lots of great techniques and fantastic threads and embellishments. Needle felting even! Woo Hoo! This one's stitched by me! I was fortunate to be able to teach this class at a few shops. It made its debut at Bedecked and Beadazzled in Baltimore Thanksgiving weekend. Then, it made its way to Serendipity in Tuscaloosa, AL. The most recent adventure for Wizard was at the Blue Bonnet Retreat in Texas! What fun we had! My students are the best! I am so fortunate to be able to do what I love and have wonderful people to share it with! Here are a few of the final results shared by some of my students. 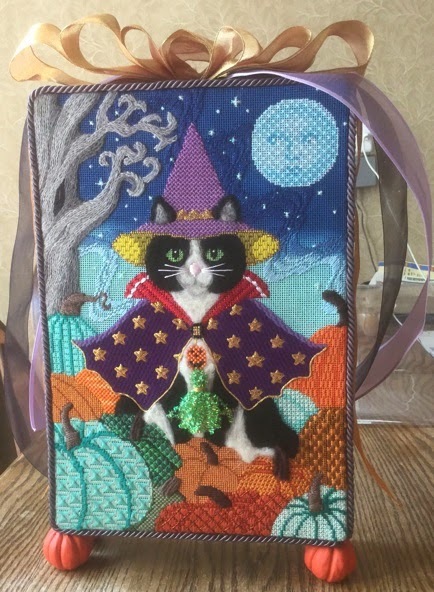 This beauty was stitched by Ellen Smith and finished by Sharon of Mountain Shadow. Look at those clever swirls in the frame. Ellen added her personal touch in some spots including the turquoise pumpkin at the left front. Love it! Harriet Rose also finished her Wizard in record time. Look at the similarities in the framing. Love the rich blue and purple accented with the oranges. Harriet added her own personal touch also. Not only is it evident in the turquoise pumpkin on the bottom left corner, but look at those cool stars in the sky! Not to be outdone, Jan Stone shared her fantastic piece most recently. I know I should be focusing on the wonderful job she did with her stitching but I am enjoying the cuteness of the finishing. Look at those pumpkin feet! Just too much! Love them. 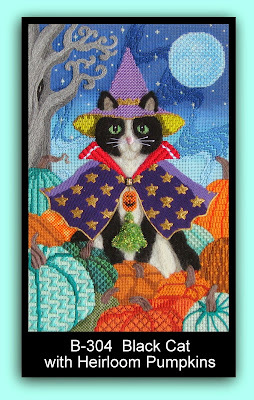 The finishing was done through Cindy’s NeedleArt by Jennifer Ure van Velzen. For those of you who are interested in this piece, your local needlepoint shop can order the canvas as well as the stitch guide from Brenda Stofft Designs. I know you will be able to follow the excellent stitch guide which provides clear diagrams and detailed instructions. If you have any difficulty ordering, just let me know and we can get you all fixed up! Always willing to enhance that stash - we all need enablers, right! I cannot be happier with the pieces the students have shared with me and allowed me to share with you! Keep it up gals and thanks! STUCK AT HOME? FEELING LEFT OUT? When I started working on this post I thought of the movie 'Home Alone' - don't ask me why because I have never even seen the movie. But I was sitting here thinking how fortunate I am to be able to travel and attend many stitching gatherings - true, I am working and teaching - but I am still exposed to others and it is just as exciting (or maybe more so) for me to share my love as it is for me to actually be able to do it. I also was thinking back to my childhood and how and where I was raised (in a holler in Logan County, WV) and I never heard of needlepoint, much less the idea of classes, etc. I did crochet, embroidery, cross stitch, etc. but we took someone's doily, looked at it, and that was our pattern - we figured it out, how many double crochets, single, chains, etc. I was a married adult before I learned there were such things as written patterns! Threads? Oh my gosh, we had floss and Red Heart yarn! That was it. We could get it when we went to town once a month. Today we are blessed with technology such that if I were back at my home place I could be exposed to these wonderful adventures without ever leaving the house. 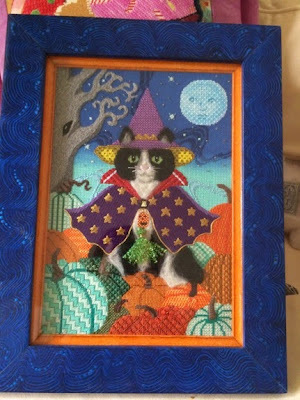 While I say we are blessed, there are still so many who do not have the luxury - and, yes, it is truly a luxury - of a local needlepoint shop, much less abundant shops such as in the Houston area. But just because there are those who do not have that luxury, technology has narrowed that gap and provides a venue for people with the passion to be able to participate in this wonderful art and share by communicating back and forth even though they may not have the means to travel, the time to do so, or the freedom from obligations of family and work. My Online Classes allow me to share my love with yet another group of individuals - many of whom have no way of taking classes otherwise. And oh what wonderful people I am meeting and some, through repeated class participations, I feel, have become friends although I may never meet them face-to-face. And they have met other friends through those participating as well. We run the gamut of ages, ethnics, cultures, experiences, economies, education levels, and on and on. However, we are all one in these classes because we are bound together by a common bond and passion. We are not judgmental (or at least I am not aware of that trait being present). We are not critical. We are all here to learn (and yes, I, too, learn something new constantly) and help each other overcome an obstacle that might be in the way of our conquering another phase of our precious art. It might be matching a thread dye lot for the project, trying a certain stitch a different way, or sharing an experience brought about by a beloved pet. Or, we may be here just because we love the design. Or, we may be here just because we want to be; we know that those in the group totally understand where we are coming from because we all have that common thread, no matter how thin, or else we would not be here! As stated before, we are taking enrollments currently for two wonderful upcoming classes. 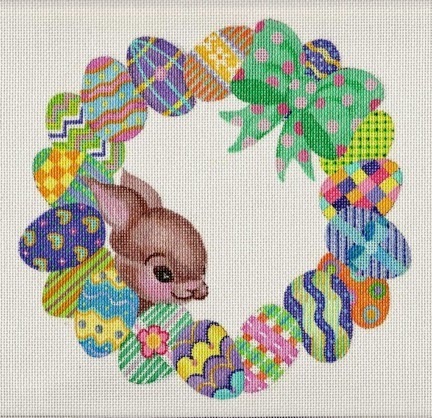 The next one was not originally planned but I just could not resist Easter Wreath. I try to keep designs that will appeal to a broad interest range but every now and then I just have to throw in one that might have a more limited interest. While this is entitled Easter Wreath I see it as just a happy, spring accent that offered many opportunities. Can you see them? The first major technique I saw was needle felting. How else can we do the bunny? Many other ways, but this is a teaching piece and I am sharing the needle felting technique on this one. Beading? I see a couple of beading techniques to share. Plaids? Ruching? Bullions? Adding ribbon? Adding sequins? And many different stitches using many different threads. The design area is hand painted and is approximately 9" x 9" on 18ct and each egg works up very quickly! If you would like to participate in this class simply send me an email to register to duodesignsinc@yahoo.com. You purchase your canvas and threads (list provided)from your local needlepoint shop and pay a lesson fee of $150 for a 6-lesson packet. Lessons are posted monthly through a secret Facebook Page. First lesson will be posted mid-July so get that canvas ordered and join us! The next class after this one is the originally scheduled one. It is an exclusive design just for us painted by Leigh Richardson of Leigh Designs. This means no one may purchase it for a year except if they are taking this class. Beijing Butterflies is so elegant and has so much to offer. The hand painted design is approximately 10"x10" on 18 ct. Oh my gosh the possibilities! We are using silk ribbons, doing an or nue`variation technique, buttonholes, adding beads and crystals, how about thread painting?, satin stitches? and using beautiful silk threads as well as many other wonderful elements. The first lesson for this Online Mystery will be posted mid-August. 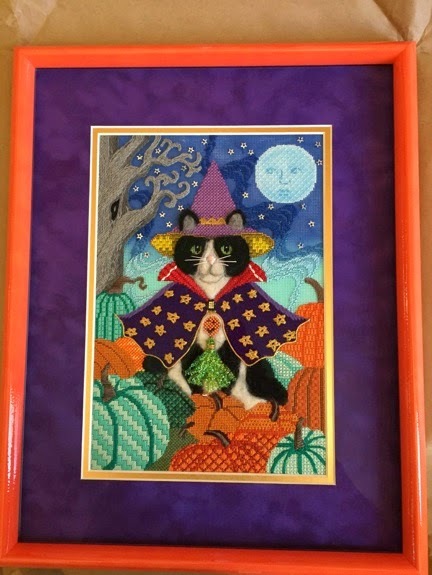 You purchase the canvas from The Needle Works in Austin, Tx., and gather your supplies (a list is provided as well as information on shops that will be able to provide a thread kit should one be desired). The 6-lesson packet is $150 and billed through PayPal. Lessons are posted on a secret Facebook Page once a month. To register just send email to me at duodesignsinc@yahoo.com and say you want to participate and you will receive additional information at that time. Scroll through earlier postings to see some more details about these wonderful designs! Please consider joining us! I know you won't be sorry and I know you will enjoy the journey! Here is a recent posting I did on a Facebook Page that I follow and it dawned on me that many of you may not have seen it - so I am going to share it with you this morning. Stumped for a different hair do? Did you know that you can 'torture' Flair - a wonderful product by Rainbow Gallery? It comes in a kazillion colors (sorry I don't know the exact number). And like Flair, I tend to stretch some of my descriptions. Just pick the end until you can get a piece of the 'thread' and start pulling. The chainette type tube of 100% nylon product with start unraveling. Continue until you make a bunch. 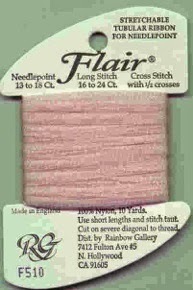 Place where you want to have the hair and tack it down with a matching thin thread. It may pull off in one long strand and it may pull of in little bunches - just keep going. I think it is fun! Red Hot Momma by ACOD is the illustration. There is a Stitch Guide available for purchase through my website - duodesignsinc.com. Come over and view all my guides - updated constantly. This and many more techniques will be shared in my class at the ANG National Seminar 2016 in New Orleans. It is entitled ' Can Do Hairdos' and is a 1-day class where we will play with many, many ways to add hair to your canvases. Watch for it and come join us. Enjoy and remember to stitch with a smile! Things are moving in high gear here at Arthur Acres! We are starting to get a lot of activity involving registering for the next Online Mystery Class - Easter Wreath. This is such a happy piece! Look at all those colors. And there are eggs, flowers, bows and a bunny! It screams Spring! The design area is 9" x 9" on 18ct canvas and is by A.Bradley - ab222. The class consists of 6 online lessons posted monthly. The first lesson is to be posted mid-July so you still have plenty of time to get that canvas ordered and join the fun! The 6 lesson packet is $150 and is invoiced through PayPal. Lessons are posted in a secret Facebook Page. My students seem to love this venue and there has been a great deal of activity going back and forth. I love it! To register simply send your email address to me at duodesignsinc@yahoo.com and state that you would like to participate. That's all there is to it! Our current class Harvest is in its second lesson and we are still having people sign up! Wonderful! As for me, I'm busily preparing kits for the upcoming TNNA Summer Market where I teach classes for shop owners to introduce them to some new designs by great designers and new products that are hitting the shelves. This year's classes are listed in an earlier post if you would like to scroll through a few to find them. We are rollin', rollin', rollin'. So much fun and so exciting. Lesson 2 is out there for Harvest, our current online class. A couple students suffered delay of receiving their supplies but I think most are on track now. The first lesson required everyone to decide how they might want to finish their piece - rectangular, domed, picture, pillow, stand up, etc. 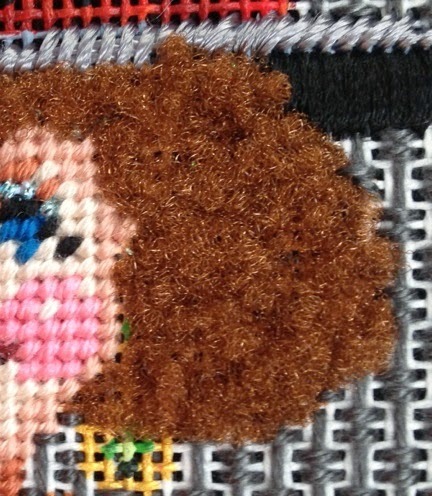 This lesson introduces beading - messy and tent stitch with lasso. 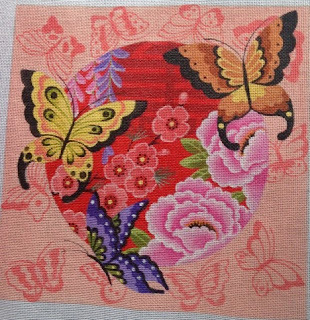 We are also adding flowers which introduces ribbon embroidery. New colors added to accent the pumpkins from the first lesson. Today we also launched the enrollment for the bonus Online Mystery Class Easter Wreath. The materials list has already been posted in the secret Facebook Page so those who enroll and have had their payment processed can access this list at any time. We also posted the Legend showing the progress plan for stitching. I am currently communicating with a couple of shops again to see if they will be a reference resource for obtaining a thread kit if desired. So more excitement going on through cyberspace. On the home front, I am preparing kits for a f2f class this Saturday entitled WHAT TO DO WITH RIBBONS AND SUCH. This is a one-day techniques class - no stitch guide - just gotta pay attention and work along as we teach the process of each technique. It is a large class but a fun class going through a lot of different ribbon, threads, 'things' such as Sparkles, Wonder Ribbon, felted balls, sequins, few beads (although there is a full 2-day class on Beading on Needlework). So, I must get to work and get these finished. Now that Harvest is approaching it's second lesson we are looking forward to our next adventures as well. I have thrown in a little bonus canvas that I had not planned to do but it was so cute that I could not pass it up. This sweet little A. Bradley canvas has a design area of 9" x 9" and an approximate canvas size of 13" x 13". There are so many things going on in this little bundle. Every area is quite manageable. AND many of you will have what you need right in your stash. Talk about a stash buster! Techniques will include couching, creating plaids, ruching, beading, plaited stitches, buttonhole, maybe Jessicas and bullions, and of course needle felting - how else could I do that sweet little bunny face. Suggested threads include Impressions, Petite Sparkle Rays, Vineyard Silk, Gloriana Silks, ThreadworX, Pepper Pot Silk, size 14 seed beads, and other embellishments. The needle felted bunny will be done at the last lesson using wool roving for the fur. Registration is now open for this cutie and will close on June 15. The first lesson will be posted in mid-July. There are 6 lessons for a total package of $150 with a lesson released each month. NOTE: The materials list will be released at the time the payment is processed! These elegant ladies are now open for registration with registration closing on July 15 and the first lesson scheduled to be release mid-August. The design is painted on 18 ct 10" x 10" on a cut canvas of 14" x 14". Threads include silk ribbons, Kreinik metallic, beautiful silks from sundry manufacturers, beads and crystals, and much more. 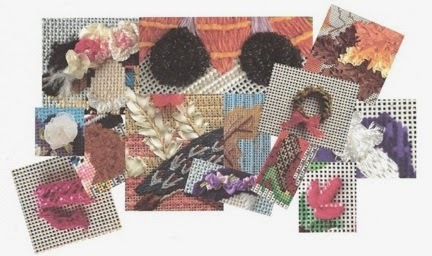 Techniques will include or nue`, beading, ribbon embroidery, buttonhole stitches, satin, packed stem, couching and on and on. Registration is currently open and will close on July 15. There are 6 lessons and the 6 lesson packet is $150. A new lesson will be released monthly. To register for either class just send an email to duodesignsinc@yahoo.com and state that you want to participate and we will send you a PayPal invoice and get you registered. So, stay tuned as there is lots going on here at Arthur Acres! Have a great Mother's Day and fantastic weekend! SILK! SILK! BEAUTIFUL PEPPER POT SILK! I have an online class currently running that is called HARVEST, a canvas by Robbyn's Nest. In these online classes I try to introduce a new thread or perhaps a new technique or approach to various stitches. It was called to my attention that many of my students were not familiar with this new thread known as Pepper Pot Silk and had not used it before. 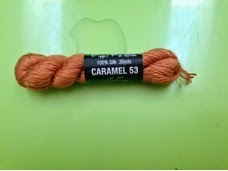 So unfamiliar, in fact, that I was asked how to open the skein and how to use the thread. I called them my Pepper Pot Silk Virgins. First, I remove the sleeve from the thread and set it aside. 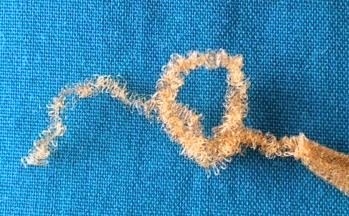 I carefully find the thread at the end that connects the twists together and I snip that thread. Carefully separate the two ends - which look like bunny ears. 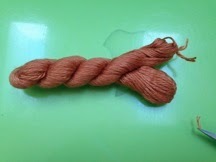 I then untwist the skein of thread - the knot is still intact. 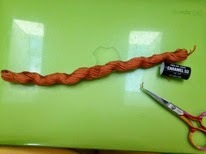 Once again, carefully separate the end (no cutting needed, just slight twist). We again have bunny ears. This time one end is a loop and one end has a knot. 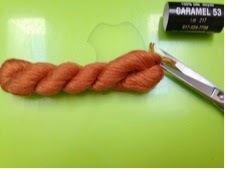 Untwist the skein. Hold the end that has the knot in one hand and cut the opposite looped end. When cut there are 26 strands of thread. 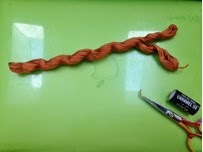 Holding the knotted end, separate a single strand of thread and pull it from the bundle. 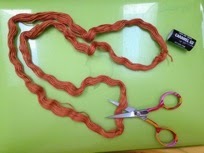 Take the sleeve and slip it back over one side of the 25 remaining strands of thread. I take mine up to the knot area. Next I do an overhand loose knot and store. Now, as you may notice, this is a long strand of thread. It is generally preferred to cut it in half again prior to stitching. If you have not tried this thread I feel it will be well worth your effort to seek it out and give it a whirl. I love it!